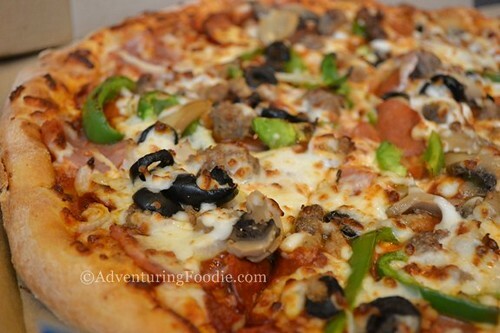 One of the best pizza I’ve tasted (within my budget then, of course) in the early to the late 1990s was Domino’s. I can still remember its old logo, and whenever my friends and I would celebrate, we would just call and have our favorite pizza delivered. 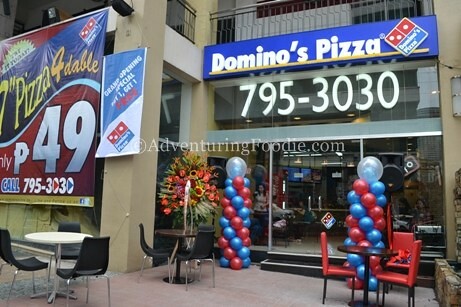 The new Domino’s Pizza in Makati. Unfortunately, there came a time when it was no longer available, and I soon forgot all about it. 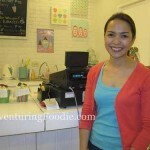 That is, until recently when I—together with other food bloggers—got invited to the opening of its 5th branch in A Venue Mall, Makati. Domino’s is back in business! Under new management, the signature design was retained; there’s that pizza box, the domino tile, and the red, blue, and white theme. 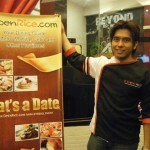 However, the colors are more vibrant, deeper and more in keeping somehow with their customers of today. The floor area inside the branch was small, but they have provided tables and chairs outside for the expected arrival of groups of friends. On its opening day, there were customers already. A lot were mature ones, attracted perhaps by the newness of the place vis-à-vis its name recall. However, some were also in the younger set, and judging by the way they enjoyed their pizza, they seemed to like Domino’s as well as my friends and I did back in the day. Ribbon cutting during the opening. 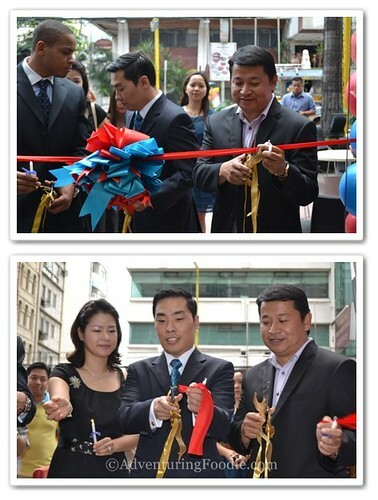 Cutting the ribbon (photo above, from left to right) were Avery Jessup of Domino’s International, Domino’s Philippines President and CEO Tong Hong and his wife Bu Rim Lee, and Makati City vice mayor Robert Peña. After the ribbon cutting and the Catholic rituals of blessing the place, the much-awaited feast began. Their bestseller cost P299 to P599, and it was indeed worth it. The crust was done just right, and the servings of pepperoni, ham, beef, sausage, onions, green pepper, and mozarella cheese were generous. In less than 5 minutes, the box was empty. 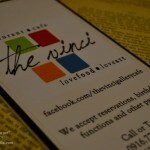 We had the Potato Pizza next, which costs from P249 to P599. It’s so named because there’s a wedge of potato in each slice. The other bloggers found it weird, but I absolutely loved it. 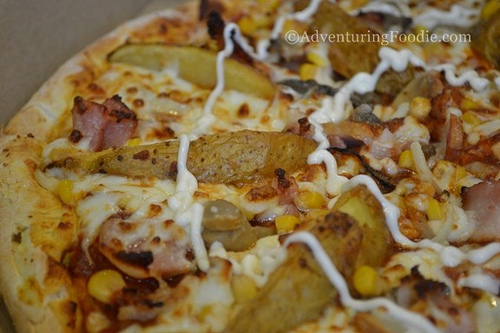 The taste of the baked potato combined with the taste of bacon, mushroom, onions, sweet corn, and mayonnaise made it stand out from the other regular pizza flavors out there. 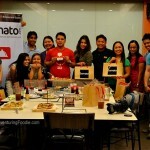 Our last serving was the Margherita pizza. 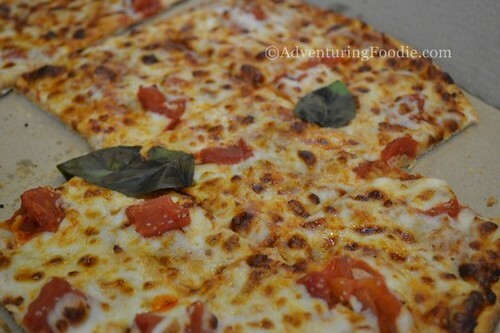 I had high hopes for this one, because I tasted a Margherita in Luca’s Pizza in Puerto Galera, and I couldn’t forget it. Domino’s version, however, leaves much to be desired. It was toasted too much that you couldn’t really taste the tomatoes. Adding whole basil leaves was a good idea though, as it made the pizza seem healthier. On the whole, I much preferred the other two. There were still a lot of slices remaining and even though I was still hungry after a slice each of Extravaganzza and Potato, I didn’t want to eat more of this.